Church developed a special full-time unit that combined European colonists, selected for their frontier skills, with friendly Indians in order to carry out offensive strikes against hostile Indians and French in difficult terrain. He used such rangers as militia where the normal practices of having troops march and attack in formation were ineffective. His memoirs, Entertaining Passages relating to Philip's War, were published in 1716 and are considered to constitute the first American military manual. Born in Plymouth Colony in about 1639, Church was brought up according to colonial practices on the frontier. He married Alice Southworth on December 26, 1667 in Duxbury, Massachusetts. He resided for a time in Duxbury and later moved to Bristol. He later lived in Little Compton, Rhode Island, where he and his wife were both buried. Her gravesite is marked by a historically significant stone known as a table grave. During King Philip's War, Church was the principal military aide to Governor Josiah Winslow of Plymouth Colony. Commissioned by Winslow as a captain on July 24, 1675, he fought during King Philip's War (1675–1678) on the New England frontier against the Wampanoag, Nipmuck and Podunk tribes of Indians. He is best known during this time for commanding a company of Englishmen and Native Americans independently of the governor's direction. Church's men were the first colonial force to be successful in raiding the hostile Indians' camps in forests and swamps. During previous decades, colonists had been on the defense against the Natives, who knew their territory intimately. Relations were generally peaceful until 1675, but tensions had been growing as the colonists and their views of property encroached on Indian territory and hunting grounds. 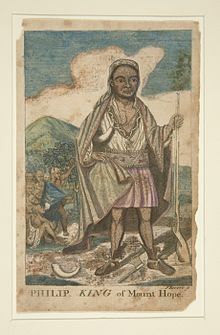 Church was allowed to recruit Native Americans after he and other leaders realized that traditional European military tactics were ineffective in frontier warfare. He also persuaded many neutral or formerly hostile Indians to surrender and join his unit, where they operated skillfully as irregular troops. Some of these men had converted to Christianity in settlements before the war. They were known as Praying Indians. After being organized by Church, these troops tracked hostile Indians into the forests and swamps, and conducted effective raids and ambushes on their camps. During the Great Swamp Fight on December 19, 1675, Church was wounded while playing a leading role in the battle. His forces killed an estimated 300 Narragansett warriors. After the Great Swamp Fight, Church and his forces hoped to follow the surviving Narragansett to their villages. Instead, Church and others became stranded in enemy territory and without provisions. Their expedition had to fight to survive and eventually were forced to eat their horses rather than starve. The war soon ended after an operation by Church's company on August 12, 1676. John Alderman, one of Church's Indian allies killed the chieftain King Philip (also known as Metacomet). Upon inspection of Philip's body, Church is quoted as saying "a doleful, great, naked, dirty beast." Philip was butchered in a manner standard with English punishment for treason, drawing and quartering. During King William's War (1688–97), Church led four New England raiding parties into Acadia (which included most of Maine) against the ethnic French Acadians and hostile Native Americans, including the Abenaki. On the first expedition into Acadia, on September 21, 1689, Major Church (who was promoted to major and given command of the expedition by the Council of War of Plymouth Colony on September 6) and 250 troops defended a group of English settlers in the Battle of Deering Oaks (also known as the Battle of Brackett's Woods). The British were trying to get established at Falmouth, Maine (present-day Portland, Maine). Although 21 of his men were killed, Church was successful and the hostile natives retreated. Engraved portrait by Paul Revere that was believed to be of Church. Yale University Art Gallery. The portrait has been identified as English poet Charles Churchill. See . In Church's second expedition a year later, on 11 September 1690 he commanded 300 men at Casco Bay. 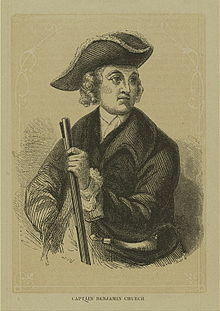 His mission was to relieve the English Fort Pejpescot (present day Brunswick, Maine), which had been taken by natives. He went up the Androscoggin River to Fort Pejepscot. From there he traveled 40 miles up river to Livermore Falls, Maine, where he attacked an Androscoggin native village. Church's men shot three or four native men as they were retreating. Church discovered five English captives in the wigwams. Church killed and butchered six or seven prisoners, and took nine prisoners. A few days later, in retaliation, the Androscoggin attacked Church at Cape Elizabeth on Purpooduc Point, killing seven of his men and wounding 24 others. On September 26, Church returned to Portsmouth, New Hampshire. Church's third expedition during the war was in 1692, when he raided the Penobscot territory of (present-day Indian Island, Maine) with 450 men. Church and his men went on to raid Taconock (superseded by Winslow, Maine). Four years later, Major Church conducted a fourth expedition. He carried out the Siege of Fort Nashwaak (1696) (present-day Fredericton, New Brunswick), which was then the capital of Acadia, and the Raid on Chignecto (1696) in Acadia. He was described as weighing approximately 250 pounds, but personally led his troops. They killed the inhabitants of Chignecto, looting their household goods, burning their houses, and slaughtering the livestock. During Queen Anne's War, Church went on his fifth and final expedition into Acadia. The Deerfield Massacre had taken place in western Massachusetts on February 29, 1704, believed conducted by Indians provoked by the French. In addition to killing many settlers, the Abenaki and allies took more than 100 captives overland to Montreal and the Mohawk village south of the river. The captives were often held for ransom by families and communities; some of the younger ones were adopted by Mohawk families. On March 18, 1704 Church was commissioned as a colonel by Massachusetts Governor Joseph Dudley and placed in command of a force to raid French settlements in Acadia in retaliation for Deerfield. This expedition included the following actions: the Raid on Castine, Maine, Raid on St. Stephen, New Brunswick, Raid on Grand Pre, Raid on Pisiguit (present day Falmouth and Windsor), and the Raid on Chignecto. Church meticulously planned the expedition. He specified the design of whaleboats to be used in the raids and what kind of hatchets his soldiers were to carry. Church took John Gyles, formerly held as a captive by the Maliseet, as his translator. Church took prisoners and claimed to have left only five houses standing in Acadia. In the Raid of Pisiguit (1704), he took the leader Noel Doiron as prisoner. Planning each operation in advance, not leaving anything to chance. Ensuring that soldiers under his command were properly trained, fed, and equipped. Building alliances with potential allies (i.e. Native Americans), who may have been overlooked or mistrusted by other commanders. Not inflicting unnecessary damage or harm. Using stealth and surprise to tactical advantage. Understanding how a tactical operation fits in with strategic objectives. Leading by example and from the front. Maintaining communications with higher and lower echelons. Church was elected to public office as the first representative of Bristol to the Plymouth Colony legislature, serving between 1682 and 1684. Church died at Little Compton in 1718 and was buried in the Little Compton Common cemetery. Church kept notes on his tactics and operations in 1675-1676. His work was eventually published in 1716 as Entertaining Passages relating to Philip's War. Church was the great-grandfather of Dr. Benjamin Church, the first "Surgeon General" (though that title came later) of the Continental Army. Dr. Church, thought to have been a staunch Whig, was later arrested by General George Washington as a suspected spy for British General Thomas Gage. Rogers Rangers and Gorham's Rangers were militia developed according to the tradition begun by Church. In 1992, in honor of his innovative tactical methods, Church was inducted into the U.S. Army Ranger Hall of Fame. A bronze Ranger Tab was affixed to his gravestone to mark this. The Rhode Island Society of Colonial Wars placed a plaque near Colonel Church's grave in honor of his leadership and bravery during King Philip's War. Church, Benjamin, as told to Thomas Church, The History of Philip's War, Commonly Called The Great Indian War of 1675 and 1676, edited by Samuel G. Drake,(Exeter, NH: J & B Williams, 1829); Facsimile Reprint by Heritage Books, Bowie, Maryland, 1989. Grenier, John. The First Way of War: American War Making on the Frontier. (Cambridge: Cambridge University Press. 2005). ^ An Androscoggin Indian stronghold (Amitgonpontook) located on Laurel Hill, Auburn, Maine near the Little Androscoggin River. Attacked by the colonial militia under Capt. Benjamin Church in September 1690. ^ The Entertaining History of King Philips War. Thomas Church. Boston. 1716. Edition of 1827, edited by Samuel G. Drake, pp. 245-248. ^ Scott, S. and Scott, T. "Noel Doiron and the East Hants Acadians", The Journal: The Nova Scotia Historical Society. Lepore, Jill, "Plymouth Rocked", The New Yorker, April 24, 2006 Lepore doubts the veracity of Church's memoirs.